Work is due to start on improving the Bristol to Bath Railway Path. Bristol City Council will be undertaking extensive resurfacing, which has been funded with a grant from Sustrans and the Government's Links to Schools and Communities Programme. The resurfacing will concentrate on sections of the path that have been damaged by tree roots and will stretch between Ridgeway Playing Fields in Speedwell and the end of the path in St. Phillips. The path will be closed in sections to ensure the safety of path users and to allow the contractors carrying out the works a safe working environment. A number of 24 hour closures will take place, with full signed diversions in place for pedestrians and cyclists. Work will commence on Monday and last for around two weeks. Motorists using roads adjacent and parallel to the Railway Path should expect a higher number of pedestrians and cyclists to be sharing routes between the March 19 and 30. Adrian Roper, Sustrans regional director, said: "We're glad to be able to work in partnership with Bristol City Council on this project. "We recognise the good work that Bristol is doing to promote walking and cycling in the city." 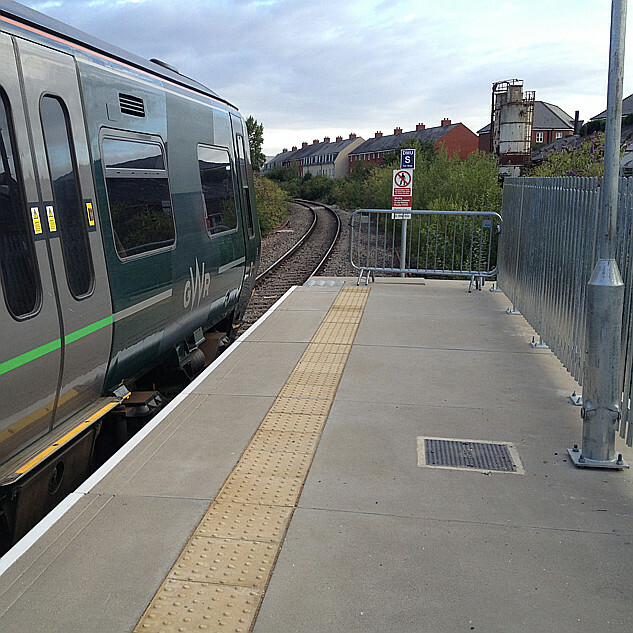 We were disappointed by recent reports in The Bristol Post about the potential use of The Railway Path for a light rail connecting the two cities. We believe the trackbed of the former Midland Railway line would not be a suitable location for a rapid transit link and there would be substantial local opposition to any plans. Light rail use of the land would not be compatible with the majority of the path’s current usage value. Indeed, when bus rapid transit was last mooted along the path exactly a decade ago by the West of England Partnership, there was such a community response that over 7,000 signatures opposing the plans were collected in a month. When the Bristol and Bath railway path was first established, it was done on the clear understanding that it would be returned to rail use should the need arise. Are you trying to renege on that commitment? Your claims that the route is too narrow simply do not stand up. The original railway was double track through its entire length, and the current tarmacked section uses only approximately half the width of the trackbed, so what's the problem? Experience around the Bitton area has shown that it is possible for the cycle track to be shared with rail, and other examples such as the reopened Borders railway and the Cambridgeshire busway also demonstrate that it is possible to accommodate cyclists alongside public transport routes with little difficulty. I read the first post in this thread and thought, Good, bits of that section are awful. Then I noticed the date; it's referring to work done almost six years ago. Shame they only did such small sections! As for the light rail link, I've no idea what understanding there was when the path was first established but I wonder if any of those original understanding parties are still around? Avon County Council has gone, and though Sustrans is still around, the path actually pre-dates them. It's been there an awfully long time now; it's actually older than the mean age of UK population (which is 41)! Width? Probably ok for a single track from around Warmley east. The Bristol end is narrower, has a couple of steep gradients and a few sharp corners. Sorry about that ... linking up new stories with old ones! This is a bit like watching two friends getting into a fist-fight. I too am intrigued by Bruce Williamson's claim that the Railway Path was "established... on the clear understanding that it would be returned to rail use should the need arise". I'd be interested to see where that understanding was documented. Presumably the people whose houses were built on the trackbed at Clay Bottom will have some reference to it in their deeds? Or is he mis-remembering? Williamson also points out that the Avon Valley Railway shares the alignment with the cycle path "in the Bitton area", and from this he deduces that there is room to share the whole route. But Bitton is one of the quieter stretches of the cycle path - the section through Easton is much busier, particularly in the rush hour; arguably it could benefit from widening. Cyclists will also be rather wary of Williamson's suggestion that problems can be solved by "a small diversion for the cycle route" - such diversions tend to be badly-planned at best, unsafe at worst. 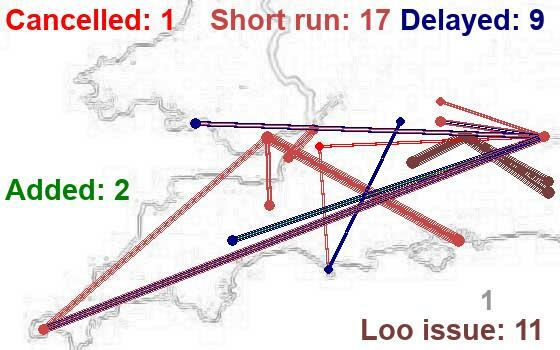 I don't mean to take sides here, but I'm worried that Railfuture are making the sort of error that leads to MetroBus - rather than committing to what is needed (a good solution along the Bristol - Keynsham - Saltford - Bath axis), they are looking at 'nearly good enough' options that might be easy. I think they'll be surprised at how not easy it is, when once again they take on the Bristol cycling community..! Many years ago in the days of Avon the proposal for the greater Bristol LRT had a line from the centre to Emersons Green which used the route of the old midland railway (now cycle path) as far as Staple Hill. That was before the alterations in the Fishponds area to build a Safeway store (now Morrisons) were undertaken. The first bit of path built on this alignment was done by the old Kingswood council, and had signs for long afterwards that directed people to the Old Railway Line (or something similar). However, the first purpose built section of cyclepath (or to be more accurate shared use path, for use of both cyclists and pedestrians) was conceived by Cyclebag, who were the cycling campaign group in Bristol in the early 1970s, who convinced Bristol council to fund a small section. From this, a number of Cyclebag members conceived the idea of building a path along the whole alignment from Bristol to Bath, and set up a sustainable engineering company called Sustrans, who put together a report for this. Once the first bits had shown how successful they were, Sustrans worked with Avon County Council on finding ways to fund and build the whole path (the rural sections were originally built as narrow lime dusted paths but Avon then improved the path to a standard tarmac 3 metre path). By this time, Sustrans were starting to put forward ways to take this idea forward elsewhere, and from this conceived the idea of the National Cycle Network. I'm not aware of any agreements which would put the path back to rail use, but I expect the statement by Bruce Williamson comes from Sustrans early statements to the effect that their work was generally saving old rail lines for future sustainable transport usage, which could include rail. Various proposals have been made over the years for this, and has been noted, various developments have occurred, such as those at Clay Bottom, which would render these very difficult or impossible to achieve. Yes, Cyclebag as a city-wide campaign group finished around the end of the 70s when it was superseded by Bristol Urban Cycling Campaign and most of its energy went into Sustrans, but a splinter group has remained in east Bristol to this day. How many houses/businesses etc are likely to have to be demolished if light rail + cycleway were chosen as an option on this corridor? Probably half a dozen or so at Clay Bottom. There are other places where it's a bit tight. Such as possible knockdown of a few Mangotsfield new-builds etc, along with realignment at Fishponds Morrisons and the closure of the Avon Valley Railway? So, well within the realms of precedent/feasibility when you consider what was done on the Borders Railway, then. One would imagine that light rail would be well-used on a corridor isolated some way from the National Rail Network, have a significant impact on the high levels of congestion there, and be easier to sell to objectors than Bus Rapid Transit was. I'd say it's down to how much balls local/regional politicians ultimately have, along with the ability of pro-light rail campaigners to outweigh their cycling counterparts. For those of us who live in the Staple Hill / Downend / Mangotsfield area, there's no end of us who hold onto the idea of the cycle path someday returning to rail use (albeit single track so the cycle / pedestrian path can remain alongside). We even have one of the old brown signs pointing to the 'Old Railway Line' at the bottom of Teewell hill just down the road taunting us! Appreciate this has caused many a long and heated debate over the years, but those of us in the North East of the Greater Bristol Area who don't have the ability to cycle are currently - and have been for a very long time - reliant on either our cars, or even worse our bus service, both of which can take anything up to an hour to reach the centre in rush hour! We were promised Metrobust in the early stages and have gone through years of disruption with traffic diversions etc while the new bus lanes were built on the ring road, only to find out later that the whole Downend area is now being bypassed completely with the new buses (if they ever run) running straight along the ring road, with our nearest stops being Hambrook or Emersons Green. Of course, they've concentrated everything on Emersons due to available parking, but what about those of us who've lived here for longer than Emersons even existed?! And as we now know even more money is having to be ploughed into it as the roads to BPW aren't wide enough for the new buses to access! So it's no wonder that we often look so longingly at the cycle path and dream of a direct rail service to escape the daily jams on Fishponds Road... and with our dreaming hats on even more so if we hadn't lost the 13 arches viaduct and could hop on a train directly to Clifton! Yup very true. Shame we don't have our own version of Tfl like London, or even better create a 'Western Powerhouse' to start getting some major investment over this way... tho am sure a lot would argue we're already getting that with the GWR mainline upgrade. That's great for those commuting thru the Thames valley, but still doesn't solve the commuter problem of Bristol itself (at least until we finally get some progress on Metrowest) and it constantly being voted as one of the most congested cities in the UK! Of course we do have our Metro Mayor now, but from someone who lives literally a few hundred metres outside of the city limits thereby falling into S Gloucs territory, the only voice we seem to hear with regards to anything transport related is from Mr Rees - multi billion pound underground system anyone?! Still, we can dream. Metrowest phase 4? !